Holy Father, your sunrise of a thousand pastel colors accompanied by birdsong praises you. Thank you for showing me your glory and reminding me of your abiding presence. When with others, I pray that they will see you and that we together will not be distracted from the path that leads us home. We've been telling folks that we've been "moved-in" for weeks. If we mean by "moved-in" that all our stuff is on the premises, we were right. In some ways, however, we haven't quite been "moved-in" until recently. There is a certain amount of personal touches needed to turn the corner of bringing not only stuff, but personality. Although there is still much to be done to get everything just so, I think we've turned the corner. 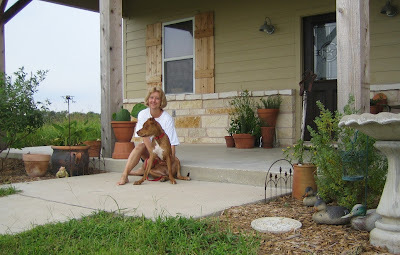 One of the major contributions was the lovely work Janet did on the front porch. She worked her magic arranging plants, bird baths, and yard art to make the entry quite inviting. Now our front porch has her personality, touch, and feel. This is our little corner of the universe. It is where her touch is evident and it is where I want to be. ...and just like that, they grow up and leave the nest. They flew around the front of the house yesterday afternoon. With shorter tails and less graceful flying than the parents, they were fairly easy to spot in the air. I hope they were catching flies while they were out there. The Scissor-tailed Flycatcher (Tyrannus forficatus) is a long-tailed insect-eating bird closely related to the kingbirds. Adult birds have grey upper parts and light underparts with pinkish flanks. They have dark wings and an extremely long black tail. Immature birds are duller in colour and have a shorter tail. Their breeding habitat is open shrubby country with scattered trees in the south central United States and northeastern Mexico. 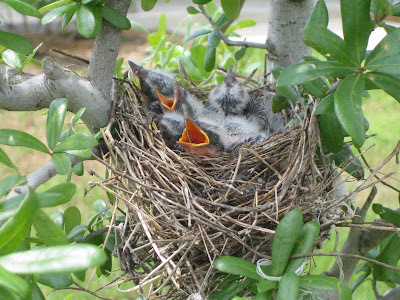 They build a cup nest in a tree or shrub on a branch, sometimes using artificial sites such as telephone poles. The male performs a spectacular aerial display during courtship with his long tail streaming out behind him. Both parents feed the young. 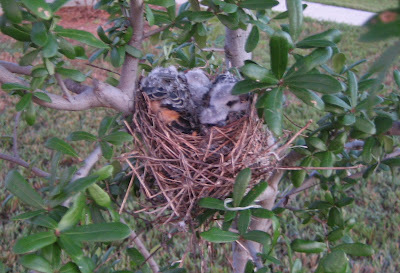 Like other kingbirds, they are very aggressive in defending their nest. They migrate to southern Mexico and Central America. They regularly stray to the ocean coasts of the US and are occasional visitors to southern Canada. These birds feed mainly on insects which they catch by waiting on a perch and then flying out to catch them in flight. They also eat some berries. This is the state bird of Oklahoma. From what has been observed so far, it looks like Wiki has nailed it. I'm grateful that our neighboring state of Oklahoma (about 25 miles away) allowed one pair to drift down for us to enjoy. Hopefully, these little ones will be getting about the business of catching flies soon. She was running short on patience with the "byproducts" being left on the porch each night. She wondered what manner of critter has been prowling around on the premises and decided to dig out the trap and see if it could be caught. 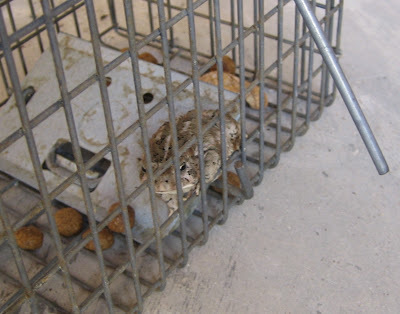 The trap went out last night and, just before the morning spin, I noticed that trap had been sprung! Hey, sweetheart, isn't that one of the critters that you consider a "beneficial"? I'm not sure, but your friend here looks a little agitated this morning. 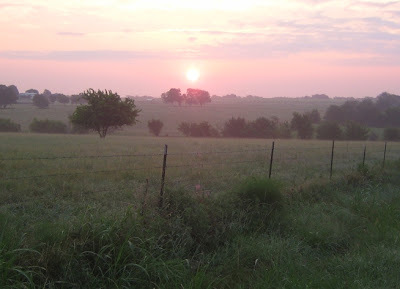 A comfortable 70-degree summer morning, a few quiet minutes of spinning the pedals, and a magnificent sunrise. Nice combination, eh? So its been a few weeks now and trying to figure out how to mow three acres of chest-high grass with a push mower has alluded me. Fortunately, with family and friends, a solution has been offered; buy a tractor. I wonder why I didn't think of that earlier? Maybe it has something to do with the dollar sign followed by five figures. 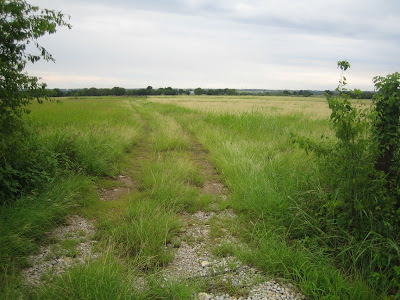 Me - I need to rent a tractor to do some mowing and dirt moving on a 3-acre homesite. Them - No problem, we've got just what you need. You need a tractor with a 5-foot brush cutter and a front-end loader. Me - Excellent. How much? Them - We'll, it's way more than you make per day, but its just what you need. Me - Oh. Would it be less per day if I rented by the week? Them - Yes, slightly, and you still have to actually do all the work yourself, but its just what you need. Me - Oh. Okay. Can I pick it up tomorrow? Them - Nope. Not till Thursday. Me - Oh. Okay. I understand you have these things on a trailer so I can just hitch-up to my truck and drive away, right? Them - Nope. the tractor is not actually ON the trailer, but we have trailers you can borrow. Me - Oh. Okay. So...can I pull this trailer and tractor combo with my half-ton pick-up? Them - (muffled laughter) I wouldn't. So here's where I think I stand. I've got to go find a 3/4 ton pickup to drive to Denton, pay more than I earn in a week, and hook up a trailer. Then I've got to figure out how to drive a tractor up a ramp (I assume) and stop it before rolling over the edge of the trailer and into someone else's pickup. Then I've got to drive it home and do all the work myself and return all the heavy equipment that I hopefully haven't damaged while trying to learn how to use it. I think I'll go back out and look in on the birds. 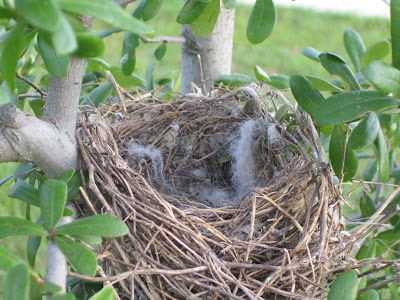 Fortunately, they've built that nest low enough that I don't need heavy machinery to see it. The list of chores continues to grow. A few things are getting done, but it seems I'm still getting farther behind. Even so, I'm not discouraged. ...and, from here, we can see the glory of God. One of the things to discover about rural living is there are more bugs. 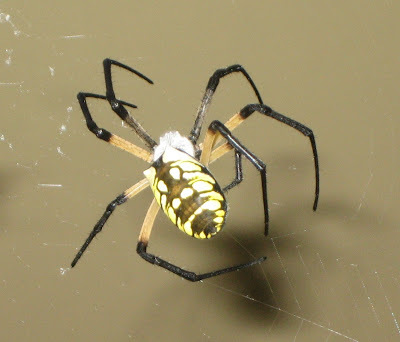 Where there are bugs, there are spiders. I don't like spiders, but my intelligent eco-sensitive gardener wife says they are not "spiders"...they are "beneficials". Yeah, well, they're still scary. Now back to the photo that doesn't quite show it like it really was. One of those nice county roads is Sam Bass Road. 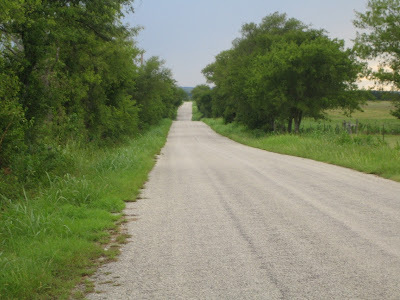 This road seems to provide access to ranch homes for folks who own larger pieces of land. It also seems to be the kind of beautiful rolling countryside land that might promote envy in the less disciplined of us. I'm blessed to live in a place like this. A place where prime cycling and scenic views are common. I'm blessed to be out here in a more rural setting...even with the so called "beneficials". 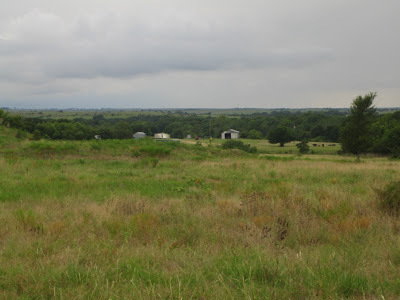 Since we've moved to rural north Texas, everything is a little more spread out. Now, a bike ride around the block is 3 miles long. It is a pleasant ride and one I like to take when lacking time. There was a short window yesterday between the afternoon thunderstorms and evening darkness. So I took a short ride around the block. 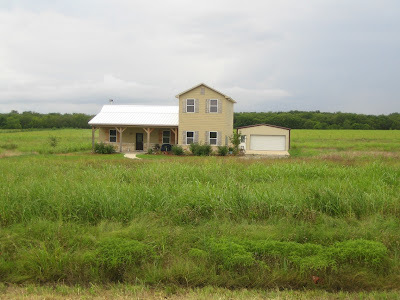 Rolling away from the homestead...hmmm, looks like the grass is getting a little high. Looks like this pasture road doesn't get much use. Here's one of my neighbors...just down the street. Nice place. Typical 3-mile loop road through the neighborhood. 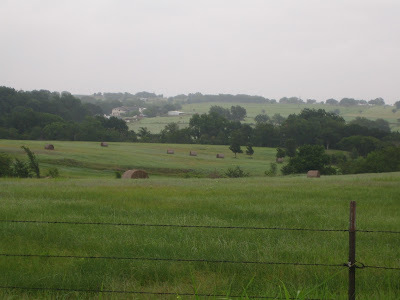 Some of the places on the backside of the loop have a nice view of the Clear Creek valley. As the rain fell in sheets and the thunder boomed, I had given up hope on riding today. But it didn't last long, the roads dried, and a window opened before dark. Plenty of time to noodle along the 3-mile loop...and dream about longer rides to come in the days ahead. If you have been checking the blog, I apologize for the lack of updates. One of the first lessons learned about living in rural areas is that internet access is not a trivial matter. 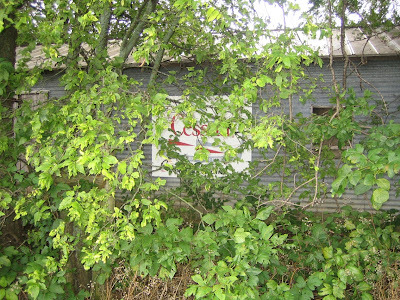 Trivial or not, it has now been resolved and today's update is about Mockingbird Hill. 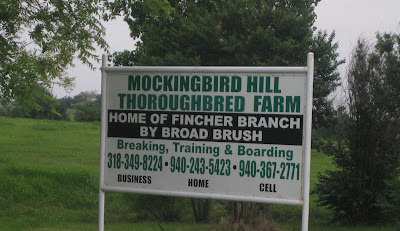 Mockingbird Hill is a thoroughbred farm located nearby. I'm here to say that Sanger, Texas, and northwest Denton County, is horse country. That means it is a good environment for Janet. It is pleasant and relaxing to look around and see them grazing. 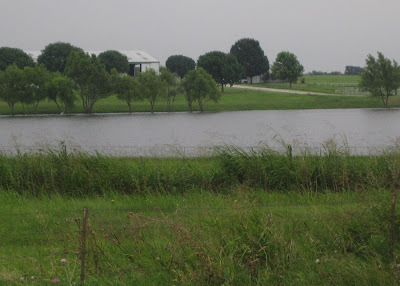 It is enjoyable to note the numerous lakes dotting the rolling countryside. It appears that horse country is also pretty good for cycling. 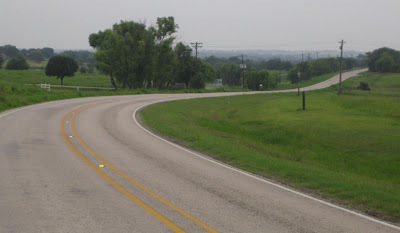 There are numerous lightly-traveled roads nearby with plenty of options for short or long rides that are scenic and do not require constant traffic vigilence. It was a cloudy, windy, and humid morning for a ride. Still, it seemed good to get an hour of riding in before the day becomes busy. 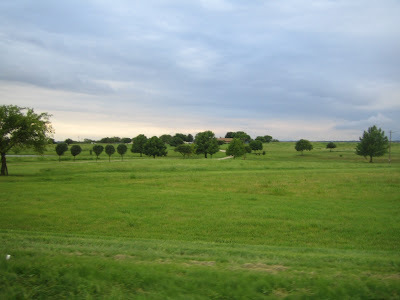 The following photo is the road along Mockingbird Hill Thoroughbred Farm (left side). Most of the roads near the new homestead look like this. Makes you want to ride...doesn't it?